In the lead up to World Idli Day on March 30th, Uber Eats revealed that the humble, healthy and hearty ‘Idli’ is the most ordered breakfast item on its platform in India. A study of the Idli orders on Uber Eats revealed that Bengaluru, Mumbai and Chennai are the top three cities that ordered the most Idli on the Uber Eats platform. · Top Idli loving cities: Bengaluru consumes the most Idlis, followed by Mumbai, Chennai, Pune and Hyderabad rounding up the top 5 idli loving cities. Globally, San Francisco, London and New Jersey are the top Idli ordering cities. · It’s Idli-o-clock: Undoubtedly, Idli emerged as the staple Indian breakfast of India with the item being most consumed during the morning, especially between 7.30 AM and 11:30 AM. Interestingly, March 10, 2019 was the day when India ordered the maximum amount of idlis. · Idli for the Health Conscious: Idli is known as a dish that is consumed by the healthy and hearty across the nation. However, health conscious Indians consumed Vegetable Idlis for a healthier, fibre-rich alternative and a nutritious start to their day, thereby making it the Health Conscious Idli of India. · Biggest Idli lover: A consumer in Mumbai ordered a whopping 110 plates of Idlis on 23rd February 2019. 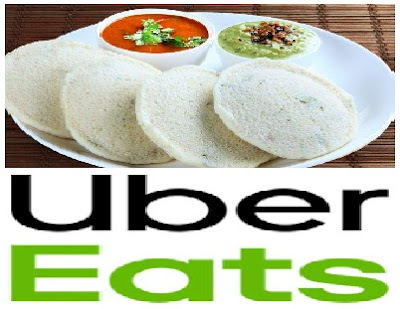 · India’s love for “extra”: An Uber Eats’ order analysis revealed that most Indians requested extra chutney, sambhar and the spicy ‘podi’ to go with a plate of steamy hot Idlis. The orders were analyzed for a period of the last 6 months.